I'm planing to spend ~3,600 for the the new 500mm PF. First have to rent one and make some side by side comparison... Zoom many times is handy thing to have but I need some better performance above 20m to the object and somewhat better AF speed (oh, and not that heavy!)... The zoom stays anyway! Concerning the Alan's comment: I had hard time choosing the lens. Took the steeper way (because I don't believe everything reviews are saying and the fact that there is a difference from copy to copy for this price tag) - rented two Tamrons and two Nikons . The Nikons were better in AF tracking department and somewhat better in the distances up to ~12 meters (and definitely better for close-ups). Didn't find obvious differences between the copies (on 25" rather good monitor). My fear was that ordering just one copy I may get lemon but fortunately it didn't happen, I didn't see any difference (not scientific test - as with the rented lenses just walked and shoot for few hours, but first thing to check was for decentering and if I need some significant AF tune...). And yes, I think Canon's 100-400 could be better lens (for higher price) but I never had an opportunity to shoot it. And yeah - I have seen many great photos taken with that lens (and this for sure is the best criteria for me)! The reviews are consistent with your findings that the Nikon 200-500mm is optimised for closer distances and the Tamron is better for longer distances. I wonder if this was just by chance or was it deliberate because review sites do their Imatests close up? I don't know the answer of your question. What I know is that going beyond some distances you have great chance to get in trouble with some other factors that can destroy the images taken even with ~16-18K lens (and I have seen this several times). On other hand I really need a lens that can deliver better in the range of 25-35 meters, good AF speed and focus tracking and lighter than what I currently have. This will work well at good conditions (not very often at the place where I'm living right now...) and somewhat better even in not that good conditions. In generally, faster AF and better distribution of the resolution across the field (you not always have a chance to frame properly during the shooting), as well better performance at the distances mentioned above are critical for me. Great shots Don! My favorite is the second one! And nice bird that I have never seen in real. Now, when you took your photos could you wrap it and send it in my direction (for sure it would be the first record of the species here) ? Trying to get some shots of a Red Admiral, who would land on a leaf and always turn exactly the wrong direction, then see another butterfly and decide to take off and chase it. After what felt like the 100th time of this song and dance, I noticed a small eye watching me from about two feet away. 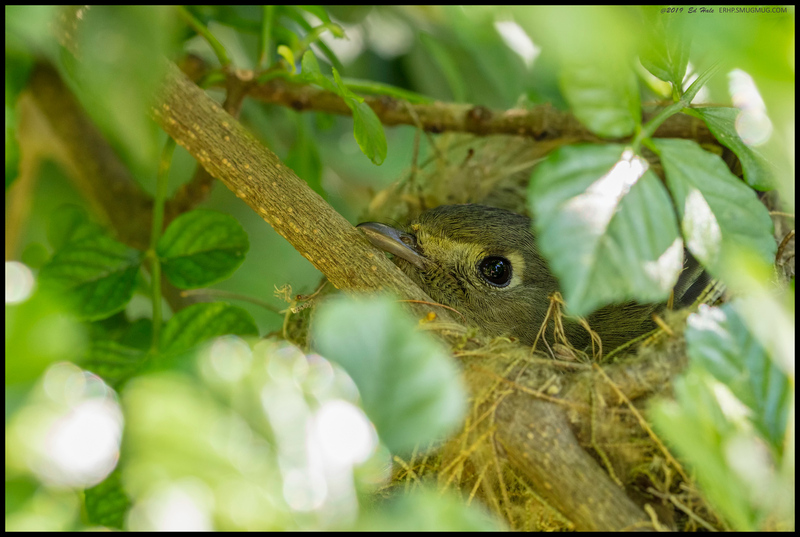 A Pacific Sloped Flycatcher had built a nest so well camouflaged by the leaves I didn't even see it so decided to get a shot of it. This is 20MP of the original 50MP image as I was using the 100 2.8L macro lens. After that I gave up on the Red Admiral as it kept landing within 10' of the nest every time. Even worse, it is right by the trail but unless people really stop and look, they will remain undetected. I love the owl shots! The second one is my favourite. I like that straight on look. As Louis Pasteur said, "Luck favours the person with a camera in their hand". And some shots from yesterday. The first one is just to give some opportunities for size comparing (I thing the mesh of the net is same as I have seen it in Europe). Not much fun on that place... Next photos are from different place, just common birds but much more fun for me ! The first photo of the Night heron is at ISO 400, second at ISO 1600 to gain some speed. Yet another nice set of pictures! With the conversation on lens quality and such in mind... I think it comes down to the photographer first and to the equipment only second to show consistently good shots! Speaking for myself only (obviously ) I've never missed detail or seen softness in your pictures distracting the attention from the subject itself - so please continue sharing! In PP I noticed it had a strange affliction on its left 'foot', anyone seen something like that before? I rally like your picture, Aaron. Well done. Went flamingo watching in February. Here are a few pictures. Very nice series, Rustom. I especially like the second and 4th picture. Thanks for the kind words Wiebe! Concerning the chaffinch, if it is not just some dirt there, it looks like Avian Pox to me.